1) California’s deceptively lovely Sierra Nevada mountains. Home to the Donner Party tragedy in the 19th Century which culminated in cannibalism, and also to snowcapped Mount Whitney, at 14,505 feet the highest peak in the lower 48 states. The 400-mile-long Sierra Nevada contains many tall peaks besides Whitney, however. Beautiful Mount Shasta, the first snowcapped peak a traveler encounters when entering California from the north, towers over the highway at 14,162 feet above sea level; and it’s only California’s seventh-highest. Add to these the Sierra Nevada’s high lakes, including unmatched Lake Tahoe, which covers nearly 200 square miles at an elevation surpassing 6,200 feet, and you’ll see why this mountain range truly is a magical place. 2) Columbus, New Mexico, a town you’d never have heard of if not for Francisco Villa. Known also as “Pancho,” Mexican revolutionary. Pancho may sound like a TV hero’s amiable sidekick, but he wasn’t. He attacked the town and burned it in 1916. The town considers itself the last in the continental United States to be invaded by a foreign power. The “foreign power” portion of the claim is debatable, but there’s no arguing the seriousness of the attack. It claimed the lives of at least eight American soldiers and nine civilians, and also about 90 of Villa’s men who died at the hands of the soldiers and civilians who fought to repel the attack. 3) Beautiful Santa Fe, a city immune to embarrassment, already a decade old when the Pilgrims dropped anchor in Cape Cod Bay, and one of the most picturesque communities in America. The wonderful thing about Santa Fe is that, like many of its neighboring New Mexican towns and cities, it’s not an artificial theme park. Its lovely architecture and Mexican-style layout derive from its history, which is considerable. Santa Fe is the oldest capital city in the United States. 4) Texas’ welcoming lower Rio Grande Valley, a semi-secret, semi-tropical semi-paradise on the same latitude as Miami. Ripe citrus hangs abundantly from trees here in the winter, and seasonal visitors find the friendliness in the Valley equally abundant. Faces of the locals here are predominately Latino, and the Spanish language, Mexican music, Mexican food and other south-of-the-border aspects of the culture make coming here almost like traveling to a foreign land without a passport. 5) Key West, Florida, a tropical town that once declared war on the United States. Where feral chickens roam, where Ernest Hemingway wrote and drank and trod the streets with a urinal on his shoulder. This is a town where “laid back” appears to be not just a description of the place, but a requirement for citizenship. Every evening, people gather by the hundreds on the waterfront at Mallory Square, for example, to watch the sun set over the Gulf of Mexico. Sometimes the crowd applauds. But only if the sunset is outstanding. Great eating and drinking here, and a tremendous party town. 6) Savannah, Georgia, one of the most beautiful cities in the South. Or in any other direction. Roll into town at the height of azalea season, as we did, and you’ll be nearly overwhelmed. Savannah’s historical district consists entirely of restored 18th and 19th Century homes of brick and wood set around 21 lovely park-like squares. Ancient live oak trees spread a canopy of branches over houses and squares alike. Silver-colored Spanish moss hangs as abundantly from the branches as tinsel at Christmastime, and in the spring, hundreds of acres of blazing reds and purples and pinks of blooming azaleas cover the ground. 7) Great Smoky Mountains National Park, a beautiful place of surpassing variety on the border between North Carolina and Tennessee. How much variety? More kinds of trees, for example, than in all of Europe. 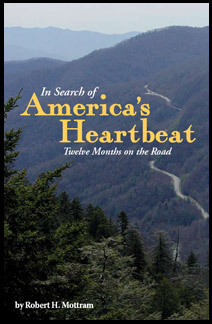 The mountains are significant here; the lowest drivable pass over the Smokies tops out at more than 5,000 feet. The people, though, are what make this corner of the country special. These are mountain folk who live around here, and it’s their culture that makes these hills and hollows so fascinating. 8) Vermont. A place where people still expect honesty, even from strangers. This is a tiny state of tiny hamlets. It’s heavily forested, mostly up and down, a place of often brutal winters, and it exerts an emotional pull on many people. Immerse yourself here for awhile, explore the back roads and the little towns, the general stores, the antique barns and the community celebrations, and Vermont will surely win your heart. 9) New York, a most surprising place. It hides a beautiful wilderness park larger than all of Massachusetts. The land is poor and the weather’s hard in the northeastern quarter of New York where the Adirondacks dominate the landscape. It’s a place that counters all the stereotypes you’ve ever heard about New York. The Hudson River here, for example, was site of the Hudson River Drive; a route not for limousines but for logs. River men and loggers floated thousands of logs down the Hudson to the mills every spring until 1950 on the river’s whitewater surge, a practice that created more excitement -- and greater danger -- than a running of the bulls. 10) South Dakota, at the same time alluring and repelling, like a beautiful woman sporting too many tattoos. Meet a settlement fueled by gold, gunpowder and greed, and a part of town known as “The Badlands,” where bordellos nurtured the economy for more than 100 years. This is a state in whose sublimest part a man has carved an entire mountain into a sculpture. How many other places have one? How many other places want one? And South Dakota, never a place to reject excess, is not content with only one.